Low tire pressure is dangerous. Unfortunately most tire leaks are slow, so drivers do not realize the extreme danger until it is too late. The solution: RealWheels LED AirGuard™ Tire Pressure Monitoring System. Ultra-bright LED allows for visual checks of each tire, even in daylight. The casing is shock-resistant, polished stainless steel. 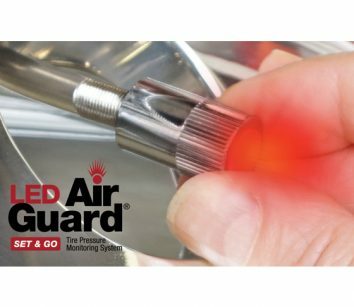 The easy-to-install LED AirGuard™ can be recalibrated and is warranted for two years. Call 800-982-1180 or visit www.realwheels.com for our new 32-page catalog.